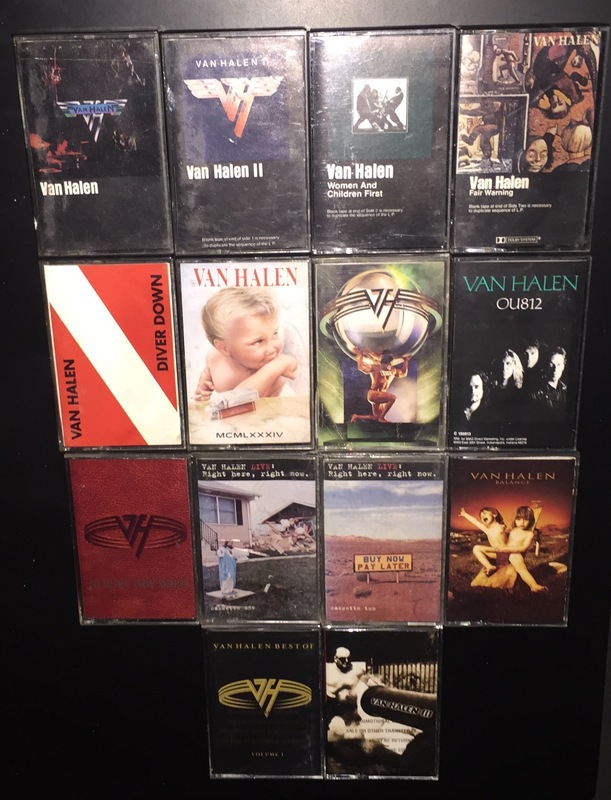 I recently donated my Van Halen cassettes to Daddy Cool Records as part of The Great Downsizing. 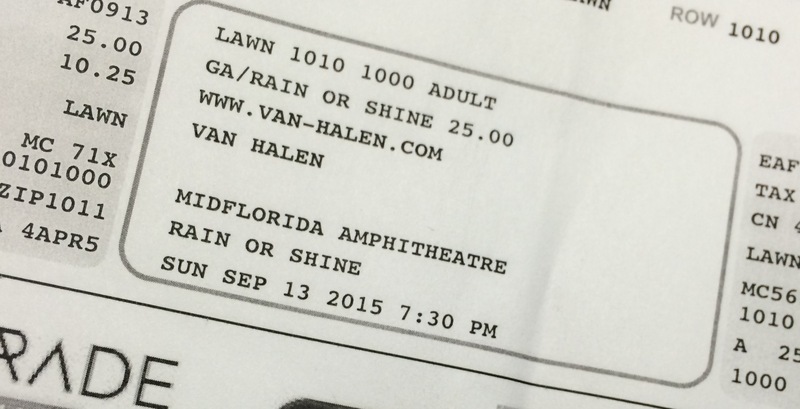 This post started out as a review of the Van Halen show in Tampa back in September of 2015. But it turned out I had thirty-something years of Van Halen, and by association Sammy Hagar, commentary that I had to get out. Realistically, how could any self-respecting rock music fan not have quite a bit to say about their history with Van Halen over the years? 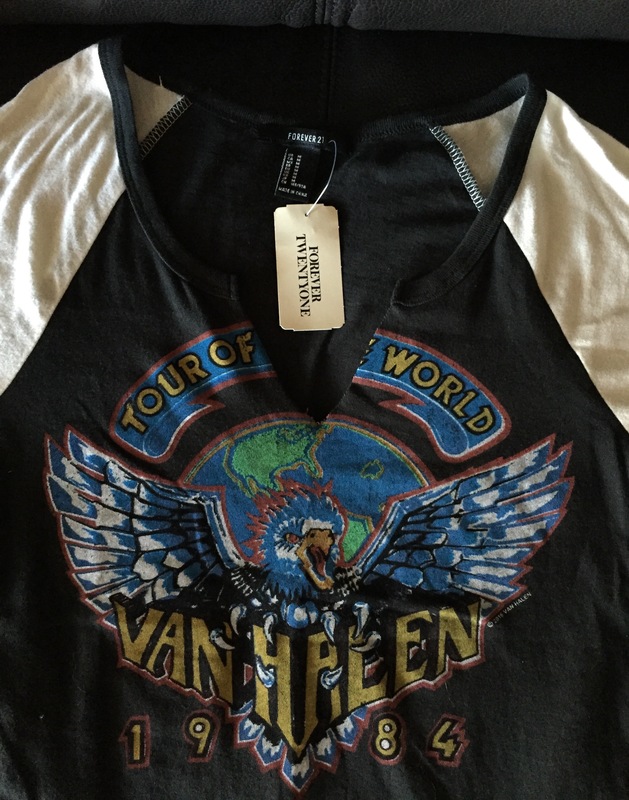 So it’s been over a year since I wrote the timeline below, but I was reminded of it recently when a friend sent me the gift of a faux Van Halen 1984 concert t-shirt that she found at Forever Twenty One, a clothing store at the mall (!). It’s got tour dates on the back, and amusingly, a pre-cut neckline. Of course my first thought was how “we” had to actually go to a show to get a concert t-shirt back when. But however these bands stay alive and find their way to the future generations is fine with me. So the shirt brought both irony (you will have to read about 1984 below to know what I mean) and reminded me to dig up this post. It’s long. I start at the beginning. 1979 – I distinctly remember the first time I heard Van Halen. It was 1979 (late, I know), I was in 9th grade, I was in the tropical courtyard paradise of the english-speaking school I attended in Puerto Rico, and suddenly I heard, coming at me loudly, proudly and like a tidal wave to my brain, Beautiful Girls. I sought out the sound that engulfed my very being. It came from a scruffy-looking fox (the ’70s term for a hot guy) with a giant boom-box-like cassette player on his shoulder walking down the hall. I had to find out what it was. Since I was too scared to ask the fox, I asked someone on the bus later. Van Halen. I immediately set out to find some Van Halen music. I had to rely on Casey Kasum’s American Top 40 for my music from 1978-1980 because there was no rock radio in Puerto Rico. Disco was huge. I recall sitting at my all-in-one turntable/cassette player/tape recorder from the Sears catalog with a fresh cassette tape in the holder, ready to push “record” if a song I wanted came on. I remember waiting for Tom Petty and Foreigner. It didn’t matter if Casey Kasem spoke over the beginning of the song telling me what number it came in at. But Van Halen was never on American Top 40. 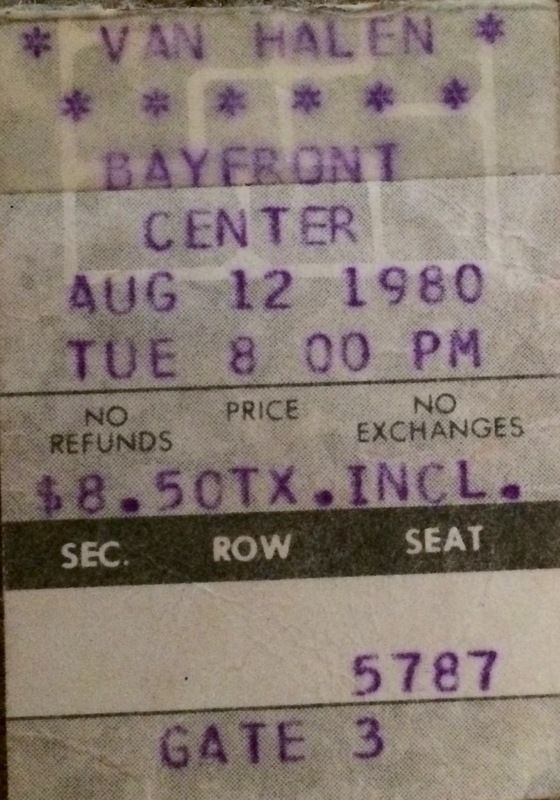 My first concert ever (if you don’t count Tony Orlando & Dawn ;o)) on 8-12-1980 at the Bayfront Center in St. Petersburg, Florida for the oh-so reasonable price of $8.50. 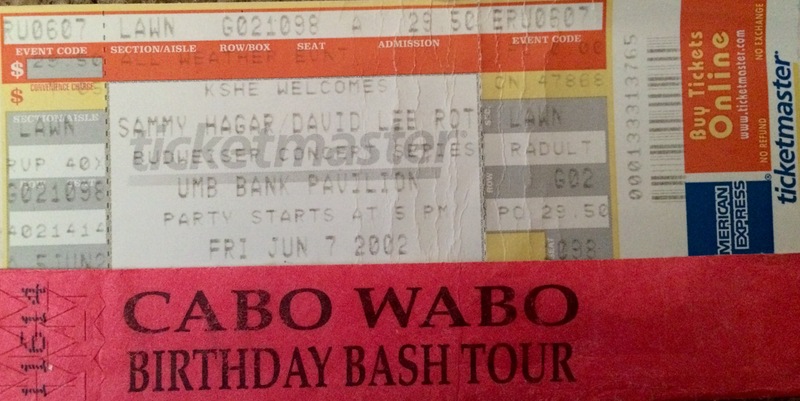 So Van Halen was my first concert ever. I couldn’t wait to see them. I looked forward to wearing my Van Halen concert t-shirt like a badge of honor to school the following day. If my Burger King paycheck was depleted, I would have asked my mom for a loan so I would have the $8 or so I needed for the concert t-shirt. I remember going up front and standing under Eddie, back in the days of general admission. Thanks to Eddie I developed a passion for stripes, a fashion statement I still can’t resist to this day. I remember the excitement and the heady feeling of the energy. But I also remember being slightly disappointed that I didn’t get to hear those amazing songs, the vocals in particular, the way I expected to hear them – either all the way through or like they sounded on the albums – because David Lee Roth kept stopping and babbling his way through the songs. But I was ecstatic with the whole concert experience. And of course I went back to see them the following year. My second Van Halen show on 8-19-1981 at the Lakeland Civic Center Arena in Lakeland, Florida. $9.50. 1981 – A great concert year for me (check out my 1981 concert ticket stubs). I clearly remember my first magical mystical musical concert high (without chemical additives, I’ll add – well, I don’t think anyways, maybe) – it was Journey’s Escape tour in 1981 shortly after my second Van Halen show. I remember singing along at the top of my lungs all night (they still played a lot of stuff from Infinity and Departure back then, my favorite Journey albums) – and feeling the energy flow from the band to the crowd to the band and back and the amazing atmosphere that elevated the entire experience to some type of spiritual level. 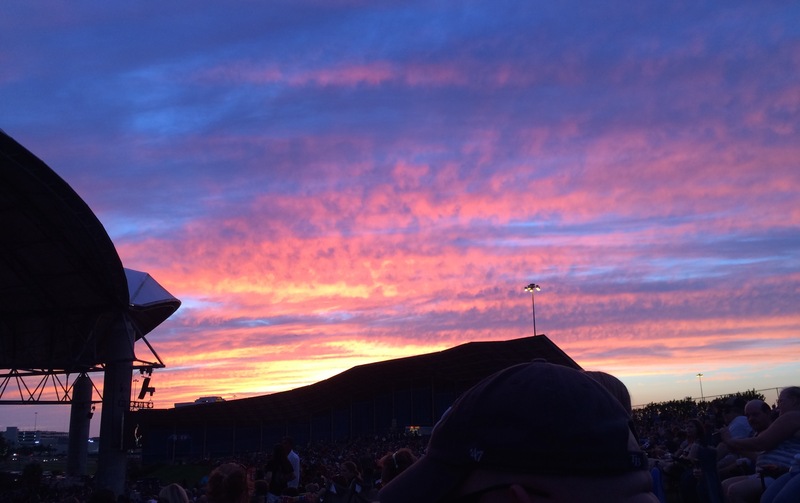 I learned what the ultimate concert experience was all about. I know it doesn’t happen every time, but it’s worth seeking out at every possible level. Two months later I was lucky enough to see the Rolling Stones on their Tattoo You tour – both Orlando shows – a highlight of my high school years. Van Halen opened both nights. The Stones were amazing. But why oh why did DLR feel the need to stop in the middle of the songs and ramble and drink, and just plain sing bad? Is it asking too much for a singer to sing at least a few songs all the way through? You can still prance and party and chatter, just give some of the songs we love some respect…please? I wanted the whole package, particularly when it came to Van Halen songs. Van Halen opened both Rolling Stones shows in Orlando, Florida, on 10-24 and 10-25-1981. Of course we went to both shows. We spent the night in a friend’s Dodge Challenger in the campground that was the parking lot. 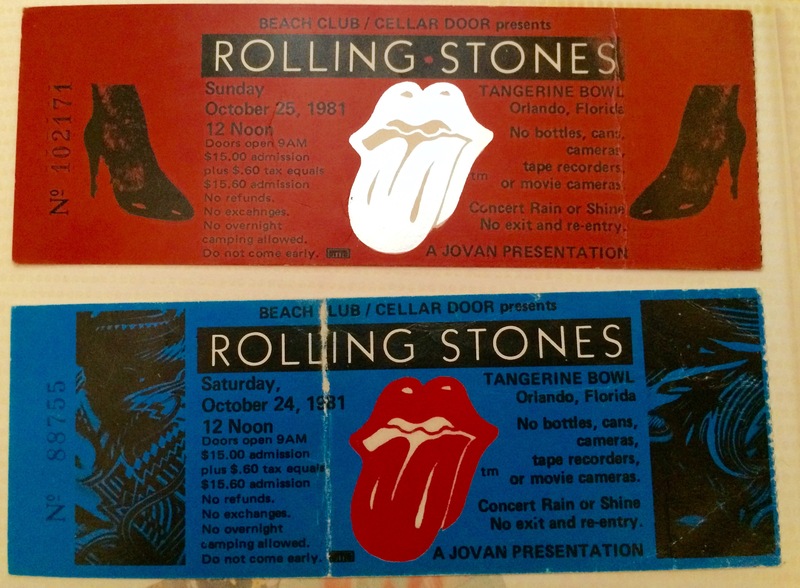 $15.60 for the Rolling Stones AND Van Halen! Now, I know that what I’m about to say is going to piss off the diehard DLR purists (I know this because I live with one). Please remember that this next statement was made with oh-so-powerful wisdom of my 17-year old self. But I clearly remember – which is saying a lot because there aren’t a lot of things I clearly remember – that I swore off being a DLR fan after that show, my 4th VH concert, for not giving me any Van Halen satisfaction (ha). Don’t get me wrong, I still loved the music, I still loved Eddie, but, to quote a photo comment I saw on Instagram recently, apparently those were his “drunk years.” I guess we all have them, so I forgive you, Dave. But I literally boycotted seeing the band live from there on out. And yes, I regret it. 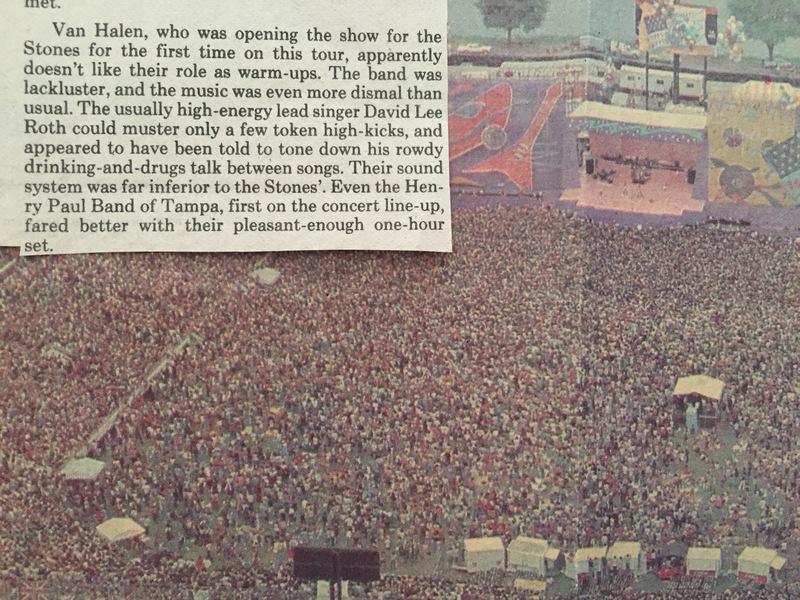 1981 St. Petersburg Times review of Van Halen opening for the Rolling Stones in Orlando. Again, don’t get me wrong here – I still loved all the Van Halen albums – how could I not? It’s just that live music is so important to me, vocals are so important to me. 1983 to 1984 – I stuck to my guns on swearing them off live and missed the Diver Down and 1984 tours. Again, oh how I regret it. And hence the irony of the 1984 concert t-shirt gift ;o/. 1986 to 1988 – By 1986 we all learned that Sammy Hagar was the new singer of Van Halen. I wasn’t really familiar with Sammy at that point – I only knew the hits. Since I was living in L.A. and absorbed in that scene, I never really got into the Van Hagar stuff in the ’80s – I loved what I heard on the radio, and I liked (and yes, smirked) that they got a new singer – but I never bought the albums. There was so much good music back then. By 1988 I looked forward to seeing Van Halen with Sammy for the first time at the Los Angeles Monsters of Rock show for the start of the OU812 tour, but alas, I didn’t go, despite having tickets. Sigh. I’m sad I missed almost all of the Van Hagar tours – 5150, OU812, For Unlawful Carnal Knowledge, Live Right Here Right Now (one of the best live albums ever). But I can’t really have regrets as I was getting plenty of great music during those years. But still. 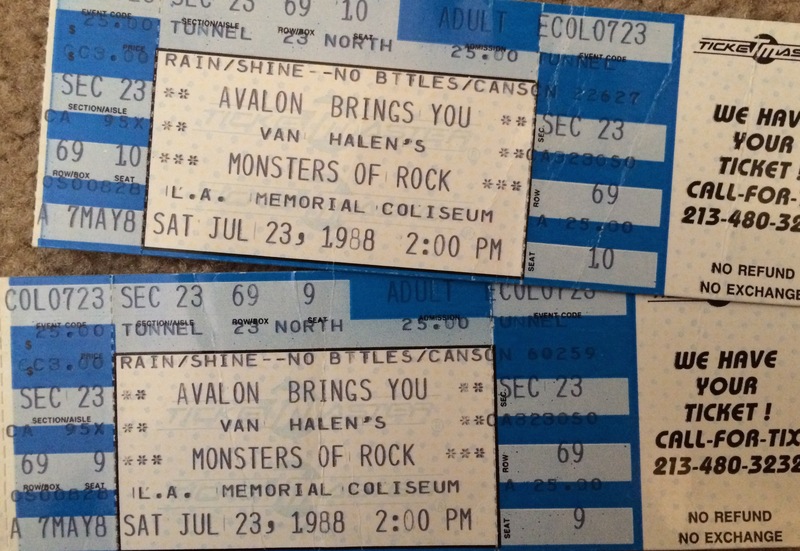 Yes, these are UNUSED 1988 Monsters of Rock tickets, where VH kicked off the OU812 tour. So sad. Long story. 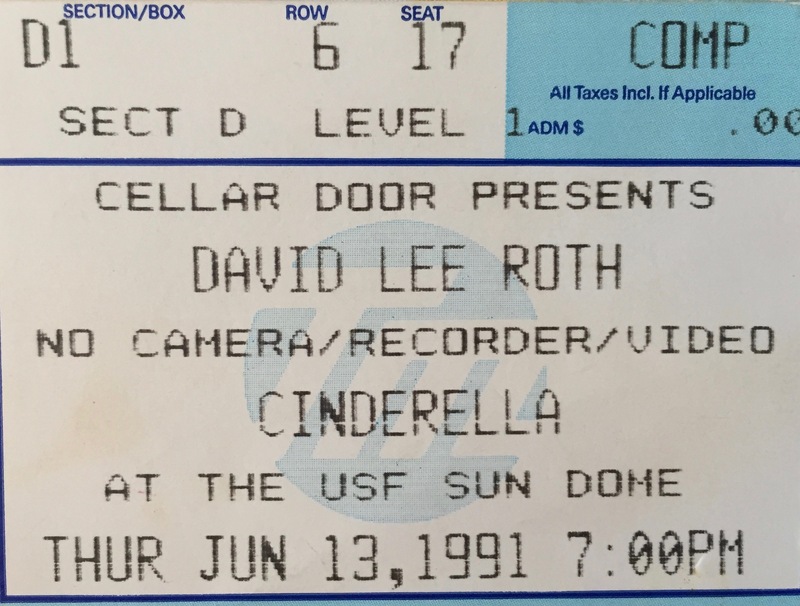 Although forgotten to me, I see in my concert ticket stubs that I went to the David Lee Roth and Cinderella show on 6-13-1991 at the USF Sun Dome in Tampa, Florida. I’ve got nothing in the memory banks on this, but I note I had a comp’d ticket. 1992 – I made a key discovery in 1992: solo Sammy Hagar. I was back in Florida. I was disappointed in the stuff coming out of Seattle and taking over radio; I listen to music for inspiration and a good time and I wasn’t getting that anymore. But alas, I discovered an amazing thing: “new” old music, which continues to be one of my favorite things (I am currently addicted to the SiriusXM Deep Tracks channel). Of course I had always been into traditional classic rock, but in the ’80s there was so much good new stuff everywhere you didn’t have to seek out the old stuff. So there I was at an outdoor party, a large kegger of sorts, and Sammy Hagar’s I Never Said Goodbye album, which I never knew existed, was being blasted out of the stage-like sound system. I was immediately drawn to the raw, hard rock good time sound, the feeling, the vocals, the lyrics – all of it. I learned Eddie produced it. I went to the used music store the very next day and started discovering Sammy Hagar – all of it, the really really early stuff, the Montrose, the Standing Hampton/VOA stuff, and finally, Van Hagar. I devoured every Van Hagar album, of which I had only previously known from the radio. And from there I kept following Sammy to the Waboritas to Chickenfoot to the Circle. I loved his vocals and the karma and the chill positive vibes. In fact I really should do a psychological review of Sammy lyrics – if you’re interested in such things, see my previous post on Hard Rock Songwriting Examined. While I disposed of my vinyl (to my brother) and CDs (donated) a few years ago, my cassettes hung around until just recently, when a local record store agreed to take my cassette donation. I hope they find an appreciative home! 1995 – We’re up to 1995 here folks, hang in there. Thank goodness I discovered Van Hagar right before their last tour. Surprisingly, although Balance is the darkest of the Van Hagar albums (it was the ’90s after all), it’s my favorite. A masterpiece of a good-bye album. 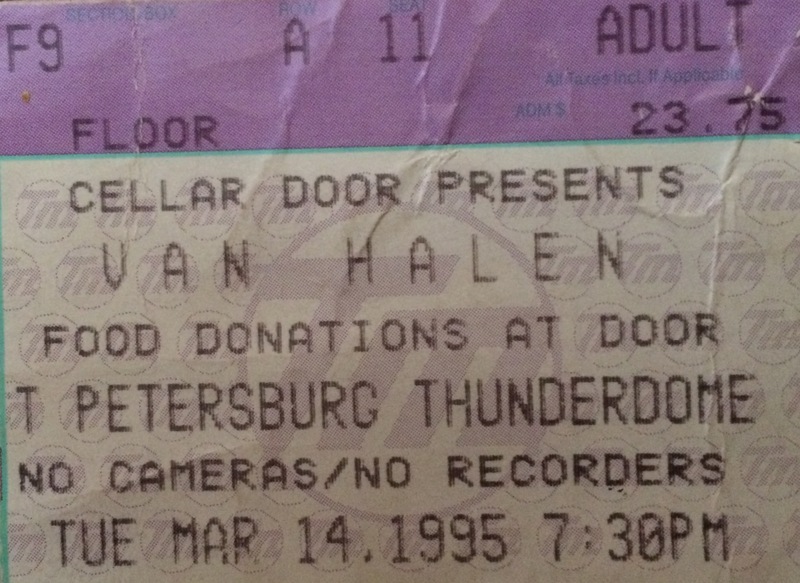 I saw the Balance tour at the short-lived St. Petersburg Thunderdome, where the Tampa Bay Lightning used to play before they moved to Tampa (later transformed into Tropicana Field, where the Tampa Bay Rays play). The memory banks are closed on the details of that show, but I do recall being absorbed in my own little Van Hagar world. I have to mention that I associate the Balance album with two of my favorite albums in that same era – the Black Crowes Amorica and Dishwalla Pet Your Friends. Those three albums dominated my car CD player for several years in the mid 1990s. 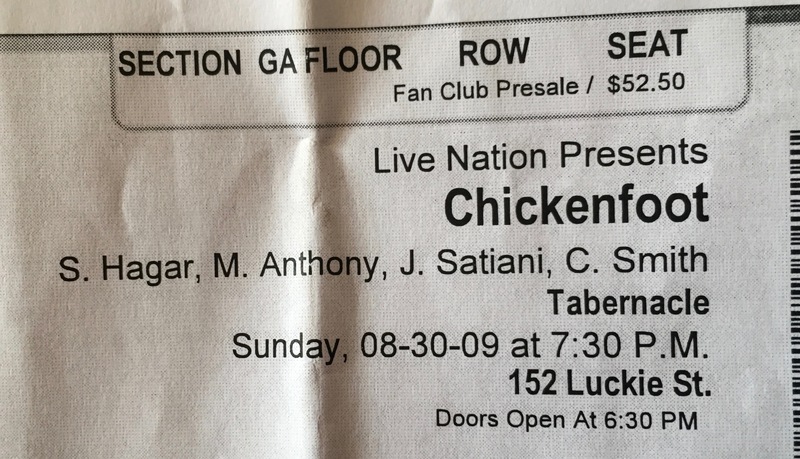 Sammy’s Marching to Mars tour on 8-27-1997 at a club in Tucson, Arizona for $27.50. 1997 -By now Van Halen is lost for the time being, but Sammy was all out and about. I saw Sammy on the Marching to Mars tour at a bar in Tucson, Arizona – I lived there for a short time and went to that show all by my lonesome. I love that album and I love love love seeing bands in this type of intimate atmosphere. He did a lot of the old hits like Baby’s On Fire that I had recently discovered and I was loving it. 1998 – Then there was Van Halen III. I was so excited about VHIII – I liked Gary Cherone and was really looking forward to hearing what they came up with. I recall they debuted with a concert on live radio, and I happened to be on a road trip all eager-beaver and excited to check it out. To say I was disappointed in the broadcast is an understatement. I was devastated. I cried. What happened? I never bought that album. My husband tried telling me a few years later that VHIII wasn’t all that bad and made me listen to a few songs and videos. I can’t quite say what happened on that album as Gary Cherone is a great singer – there simply was no magic in it, IMO anyways. I’ll mention that Gary made up for this, to me at least, when Extreme blew me away on the 2015 Monsters of Rock Cruise (twice, no less). 1998 continued in a new light – I decided it was time for a trip to Cabo San Lucas and Sammy’s Cabo Wabo Birthday Bash to either celebrate or drown my sorrows in my bar exam results (luckily it was a celebration). I was Standin’ on Top of the World that entire trip – good times, good friends. I had joined the Sammy Hagar Mailing List (for all you youngsters out there – that was an early form of social media) in an attempt to figure out how to get tickets to the shows, where to stay, etc. – this was 1998 and the internet was just really taking off. I met so many cool people on that list and on that trip, some of whom are still my friends today. And, most notably, I met my husband because of that trip. Yes, I met my husband on the Sammy Hagar Mailing List in 1998. Thanks, Sammy! We may celebrate that twenty year anniversary next year with a return trip to Cabo ;o). 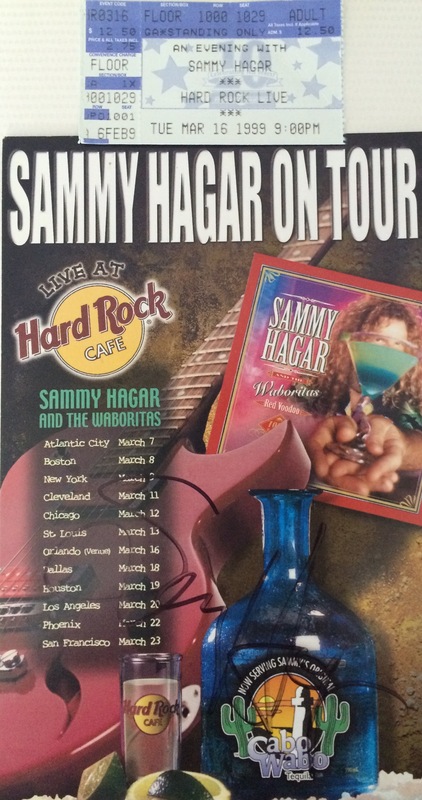 Sammy on 3-16-1999 at the Hard Rock Cafe in Orlando, Florida, $15.25. I was an upfront fanatic and got an autograph. Sammy on 5-9-1999 at the House of Blues in Myrtle Beach, South Carolina. $30. I do love a road trip to see a show. 2002 – Ah, the Sammy and DLR tour. I went to the Tampa and St. Louis shows. Sammy had just started putting up bleachers on the back of his stage for fans to stand on during the show – how cool is that? 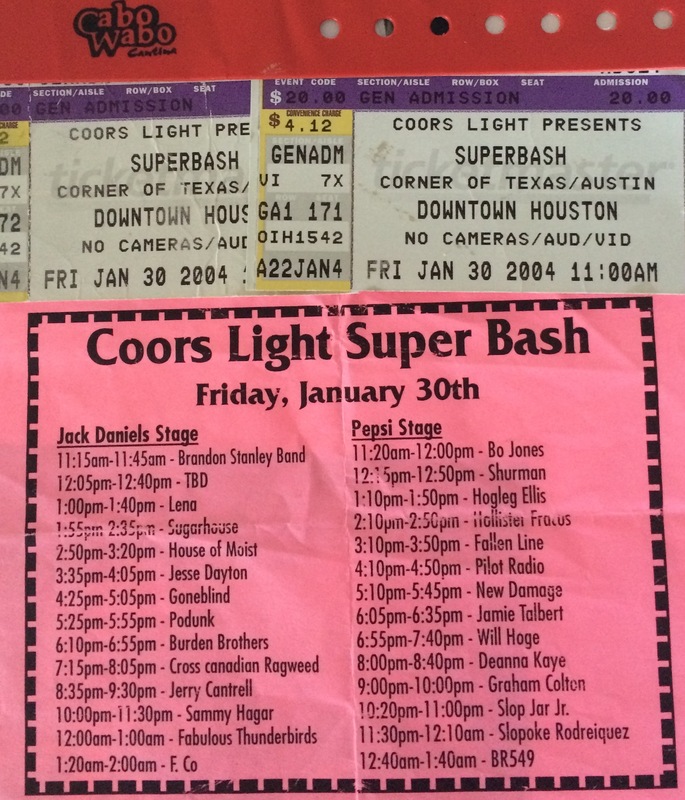 There was no VIP package stuff going on back then – this was mostly friends, fans, and radio winners. I think Sammy may have invented the VIP phenomena. Thanks so much to Paula, wherever you are, and Liza Cozad-Lauser (RIP), we got to stand on the bleachers for that show. I don’t remember much about the DLR part of the show (which I watched from the lawn) except that he continually did that end-of-lyric-add-the-Cher-like-long-ridiculous-vibrato-so-it-sounds-like-I-know-how-to-sing-thing. The Sammy Hagar-David Lee Roth Tour on 6-7-2002 at UMB Bank Pavilion in St. Louis, Missouri. $29.50+. This lucky girl watched the show from the bleachers on the stage behind Sammy ;o). Thanks, Paula and Liza (RIP). 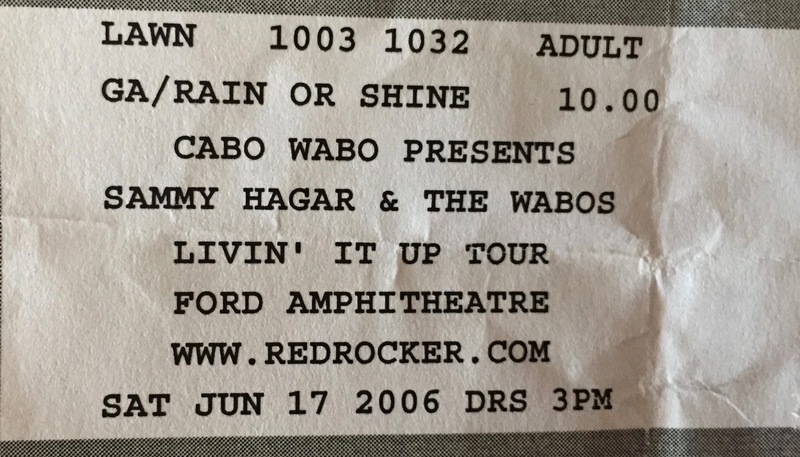 2004 – Started out with a Sammy & Wabos show in Houston and then, surprisingly, the Van Hagar reunion tour. It was strained but still cool to see and hear the songs – I saw two Las Vegas shows and the Tampa show. Sammy at the 2004 Super Bowl Super Bash in Houston, Texas. $24.12. 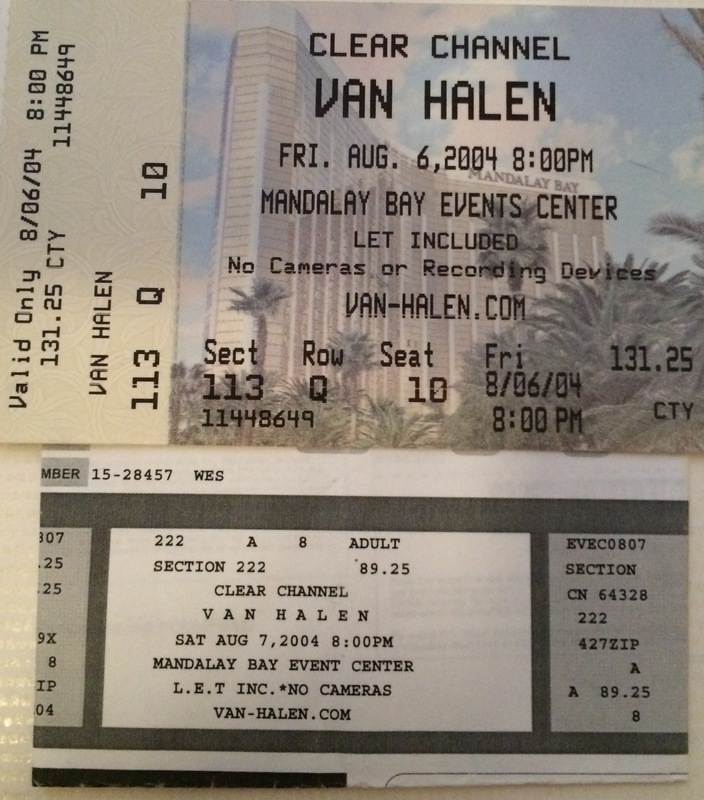 I went to see two Van Halen with Sammy shows on 8-6-2004 and 8-7-2004 in Las Vegas, Nevada. One was a gift from a colleague priced at $131.25, one was $89.25. Van Halen with Sammy on 9-9-2004 at the St. Pete Times Forum in Tampa, FL. $86.25. 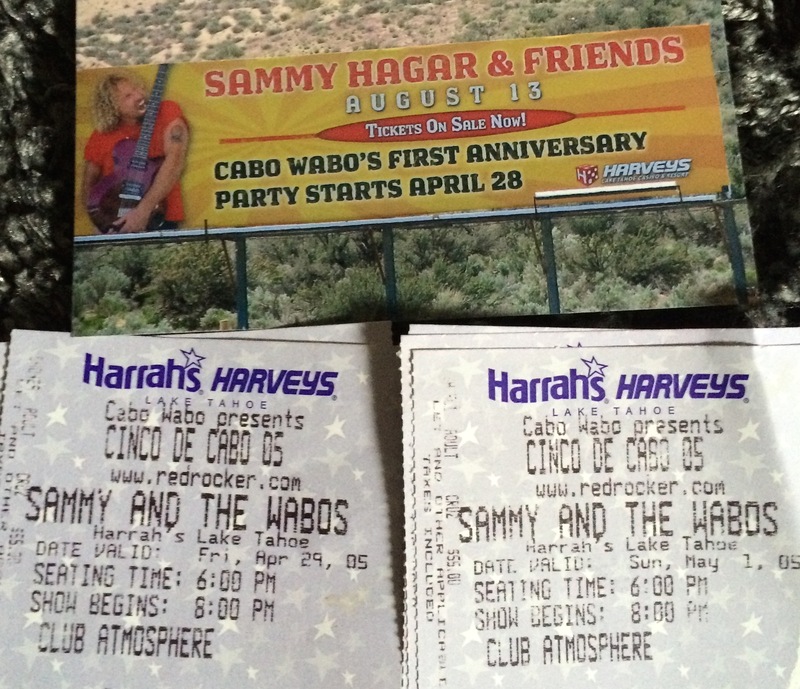 2005 – A great vacation and more Sammy shows at the Lake Tahoe Cabo Wabo Cantina. Amazing time – with a bonus, as I discovered Soul Sirkus and Jeff Scott Soto on that trip. Sammy & the Wabos at the Cabo Wabo Lake Tahoe on 4-29-2005 and 5-1-2005. $55 each. I do recall seeing DLR at Ribfest on 11-11-2005 in St. Petersburg, Florida – as mentioned, I live with a diehard DLR fan. He had a great band. Sammy Hagar & the Wabos on 6-10-2006 at Woodlands Pavillion in Houston, Texas. Met a group of redheads there, most of whom I had met in Cabo. Sammy Hagar & the Wabos on 6-17-2006 at the Ford Amphitheater in Tampa, Florida. I love the setlists Sammy played with the Wabos. 2008 – David Lee Roth is back touring with Van Halen – of course I had to go to the show to see what’s what. DLR looked fantastic and sounded decent. Eddie was sounding better than he did with Sammy back in 2004. Van Halen with DLR on 2-18-2008 at the St. Pete Times Forum in Tampa, Florida. $139.60. Chickenfoot on 8-30-2009 at the Tabernacle in Atlanta, Georgia. Good excuse to go see my good pal Cathy who lives there ;o). 2012 – A Different Kind of Truth is released. I’m ecstatic they put out new music but, eh. I’m familiar enough with the album because Grant loves it and I have to listen to it when I ride in his car. Some of the songs grew on me a little, like Stay Frosty, the wanna-be-Ice Cream Man-song. Again, I’m happy for new stuff, and that the Van Halen brothers seem happy doing what they do best with Wolfie, who got a great dose of the family musical genes. So another DLR tour. I told Grant he may as well spend the money on a solo VIP ticket and enjoy himself because I didn’t need to go. So he did. See his awesome videos on youtube here. 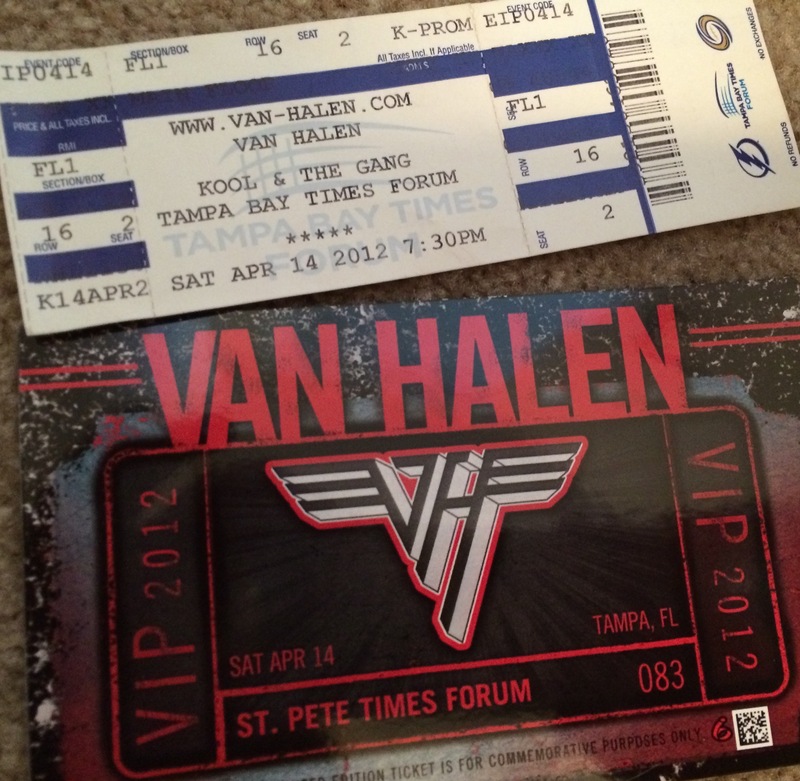 My husband Grant went VIP to the Van Halen with DLR on 4-14-2012 show at the Tampa Bay Times Forum in Tampa, Florida – check out some really good videos from that show here. 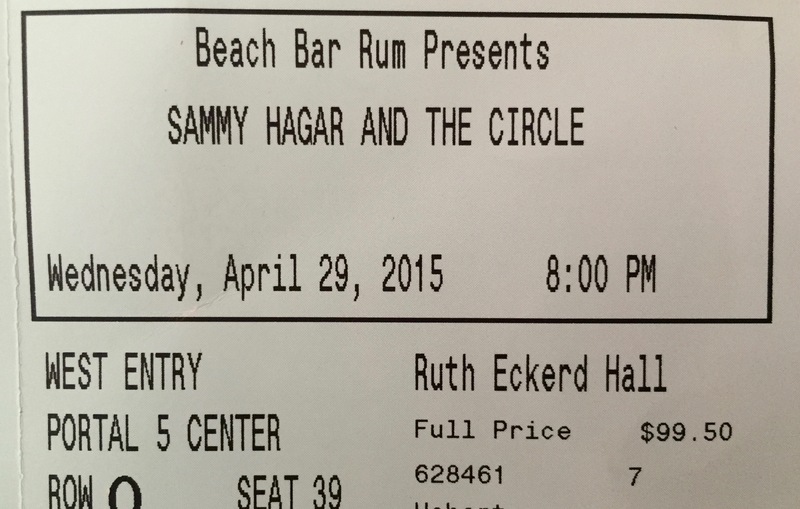 Sammy Hagar & The Circle on 4-29-2015 at Ruth Eckerd Hall in Clearwater, Florida. Really good show but how I miss the Wabos’ setlists. 2015 – Tokyo Dome Live in Concert is released. Eddie and the band are amazing. There is one vocal line that kills me: “Burnin’ down the avenue.” If you’ve heard it, you know exactly what I’m talking about. Van Halen in Tampa, Florida at MidFlorida Ampitheater in Tampa, Florida 9-13-15. I paid $17 for the ticket and $18 in service charges. By this point it’s been 35 years since my first Van Halen concert and I just had to go see them with DLR at the local amphitheater – I do so enjoy a lawn party with pals. It was probably the lowest-decibal concert I’ve ever been to – very odd. The background vocals somehow worked well to make DLR’s singing issues less noticeable. He did his twirly baton thing, which makes me nervous as I’m always afraid he’s going to impale someone in the audience (I thought he would quit this silliness after the Jimmy Kimmel incident). To be perfectly honest, I drank too much and ended up thoroughly enjoying myself and danced the night away. It was a beautiful night filled with good music, good memories, good friends, good times. If Diamond Dave is what it takes for VH to play and tour, and for new generations to experience VH, it all works for me. See more about this book at vanhalenrising.com. 2017 – It’s now been 38 years since Van Halen permeated my soul in the school hallway, and quite honestly, I’m just happy they are all healthy and happy these days. 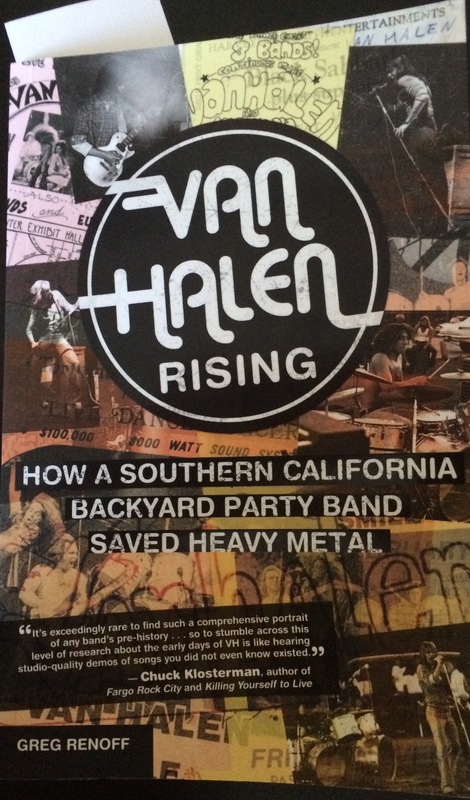 I just started reading Van Halen Rising – How A Southern California Backyard Party Band Saved Heavy Metal by Greg Renoff. So far it seems to be a good read on how Van Halen came to be and the first few years. I’m fascinated by the concept of VH “saving” heavy metal: Renoff gives a great explanation of how soft rock was taking over the radio (ala Fleetwood Mac, Eagles) and I think he’s on to something – I look forward to the read. I continue to soak in their story. Bottom line, I will always love Van Halen no matter who they bring in on bass or vocals. This said with 52-year old wisdom – that 17-year old wisdom be damned. 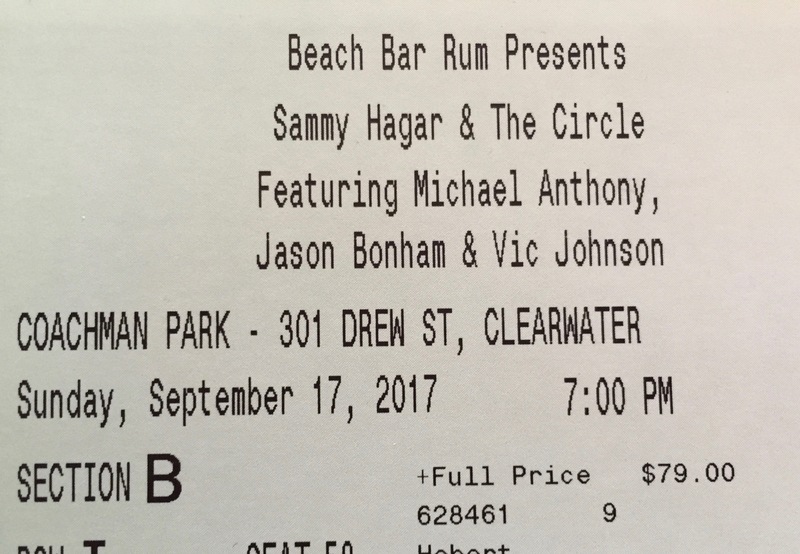 Looking forward to seeing Sammy Hagar & the Circle in a few months at a beautiful outdoor waterfront venue in downtown Clearwater, Florida – even if it is in the weird-vibe land of scientology. 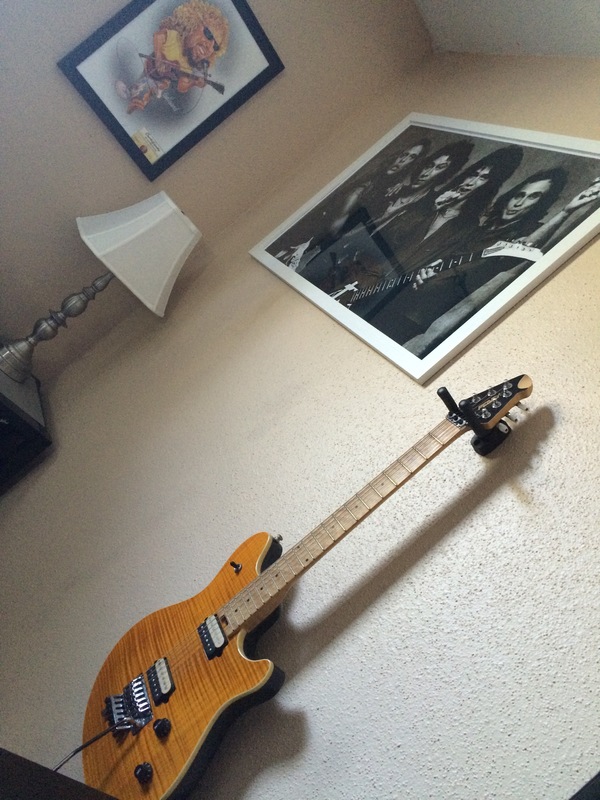 Grant’s Wolfgang guitar and DLR poster…with a nod to Sammy when I snuck into the man cave with a hammer, nail, and the Sammy caricature my Sammy-loving cousins sent me. 2017 Copyright Rocksandy. All rights reserved. Can you change my email to kellydianne4040@yahoo.com so I can still get these? Thanks. Love and miss you. Great blog/lifetime Van Halen review. I still vividly remember that Cabo trip! We must do it again! What you’re not gonna post the pic of us at the Van Halen / Stones show that made it into the local paper? HAHAHAHA Oh I love your blogs they are such a fun trip down memory lane 😀 and Hi Tami! NOOOOO I think that picture will stay hidden, and dangit I had hoped you forgot about that picture (which of course wouldn’t be unusual) LOL…and thank you ;o)! m actually at the show. Keep up this amazing blog. You rock! !